Mikme is in its very early stage of development, and as much as we try to provide a perfect user experience, our baby can still have a bug or two. Before getting started with Mikme, please check out the tutorials and videos on support.mikme.com and our First Steps start-up guide. The most essential first step is to fully charge your microphone, once you've thoroughly enjoyed the unboxing experience. A hardware reset could also be helpful if something does not work properly with the Mikme. Mikme is connected via USB cable to a charger or computer. But the charging LED of the Mikme is not blinking. The charging device needs to deliver 500 mA of charging current at a minimum (please see the markings on your charging device or check its owner manual). When connected, the microphone's Power LED (see picture: outer left) should start blinking orange within 30 minutes (if the battery was completely empty). In this case, you can relax for approx. 5 hours to give the Mikme its necessary first charge. If the LED is not starting to blink after 30 minutes at the latest, the battery is probably deeply discharged and the Mikme still asleep. You can kickstart it by performing a hardware reset. A hardware reset could come in handy whenever the Mikme is behaving strangely — nothing to worry about though. Just push and hold the Power and Bluetooth button for a minimum of 15 seconds and the microphone should awake (see the article "HowTo Reset the Mikme Microphone" for further information). The Power LED should start blinking within a few minutes. If you power on the Mikme by pushing the Power button for approximately one second, the Power LED should light up as well as the LED on the top button (Mikme logo). If this is not the case, the Mikme is either deeply discharged or it is stuck. The first thing to do would be a hardware reset as described above (and in this detailed article). If the Mikme awakes after the reset, the Power button and the top LED should light up. If this reset was not successful, the microphone's battery is probably empty and needs to be powered. Connect the Mikme to a computer or charger (See our start-up guide for further instructions). Please note that it can take a few minutes for the Mikme to start charging. After a full charging cycle (approx. 3 hours) the Mikme should power up by pushing the Power button for a second. Establishing a Bluetooth connection can be tricky under some circumstances. Please check out this video tutorial first to learn how to connect Mikme via Bluetooth. If the Bluetooth connection fails it could be a communication problem between the phone and your Mikme. So you need to draw your attention to both devices in order to make them connect. 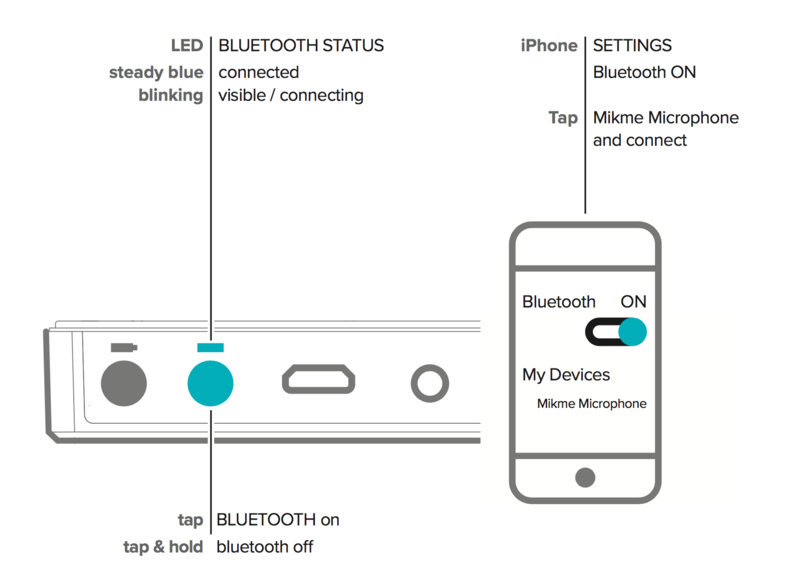 Your microphone is in Bluetooth pairing mode (Bluetooth) LED flashing twice a second) but your Mikme is not appearing as a new device in the phones Bluetooth device list. Switch the Bluetooth function on the phone off and on to reset the phone's Bluetooth connection. It could also be helpful to switch off Bluetooth and then completely restart your phone. To delete information from former Bluetooth connections you should reset your Mikme's user settings by pressing the + and - buttons simultaneously (when the microphone is powered on) for approx. 5 seconds, until the top button LED flashes 5 times. Now Mikme has forgotten all settings (including the gains) and can be freshly paired via Bluetooth. Push the Mikme Bluetooth button for 2 seconds to go into pairing mode. The Bluetooth LED should start blinking quickly (see this video tutorial). Your microphone was already connected to your phone previously but could not reconnect. Or, Bluetooth on your phone is on and the Bluetooth LED on your Mikme is blinking slowly (1x per second). If there was a previous Bluetooth connection between the Mikme and your phone, and you see the Mikme ID in your device list. Delete the Mikme from this list. Switch the Bluetooth function on the phone on and off to reset the phone's Bluetooth connection. To delete information from former Bluetooth connections you should reset your Mikme's user settings by pressing the + and - buttons simultaneously (when the microphone is powered on) for approx. 5 seconds, until the top button LED flashes 5 times. Now Mikme has forgotten all settings (including the gains) and can be freshly paired via Bluetooth. Push the Bluetooth button for 2 seconds to go into pairing mode. The Bluetooth LED should start blinking quickly (see this video tutorial). The Mikme Microphone currently works with actual version of the Mikme Audio Recording App only. Older versions of the app are no longer supported. Please visit the AppStore and get the latest version. To connect it with the Mikme App, your iOS device must be equipped with a 64bit processor. This means iPhone 5s upwards and iPad Air upwards. You'll find a complete compatibility guide here.